The classic Bangkok Rooftop bar has been an ongoing trend to hit Bangkok’s dining and bar scene, and what’s not to love about them! Would you like to chill out with friends as you feel a cool breeze in the Bangkok heat? Would you need the calm of gazing down at the often chaotic Bangkok streets? Or would you want to marvel at the modern area of high-rise buildings in Bangkok? 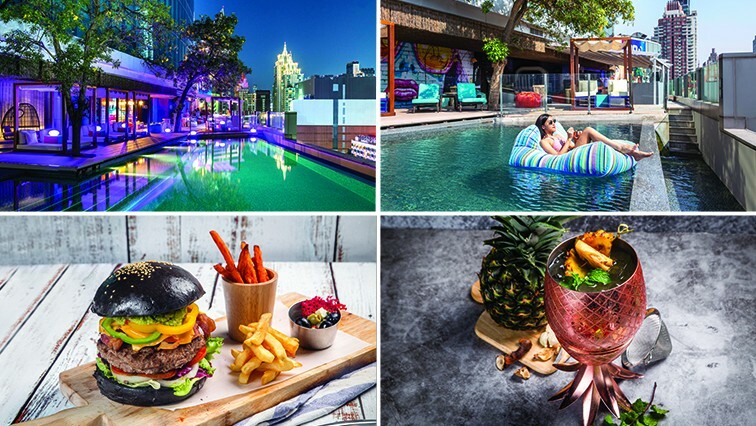 At View Rooftop Bar Bangkok on the 9th floor of the Novotel Bangkok Platinum Pratunam, you can enjoy all of these and more! Starting from 8 am – 1 am every day, you can relax the way you want, when you want! View Rooftop Bar Bangkok welcomes you whenever you feel thirsty or hungry. Once you arrive at this bar, you will feel like you are in a sanctuary. This will make you feel like you are out of an urban environment and in an oasis. Firstly, you can choose to lounge on a variety of comfortable and chic furniture including bean bags. Meanwhile, you can enjoy our signature cocktails, craft beer, wine, coffee and more. After that, dine on comforting bar favourites, burgers, pizzas, and Pad Thai from our menu. 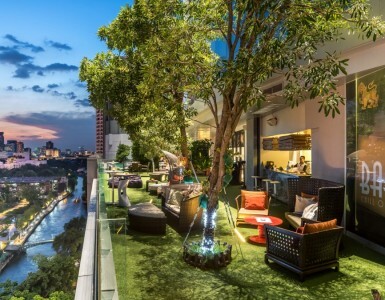 This Bangkok rooftop bar lets you enjoy the tranquil view of the early morning calm in Bangkok. Or you can beat the midday heat with a refreshing dip in the outdoor infinity pool on the 9th floor. Access to our infinity and the very chic pool is free for non-hotel guests who order food or drinks here. At night, start with our delicious signature cocktails or the classics. Later, our in-house DJ will play live music to get you to stay pumped through the night. Our secret tip? Snap selfies and catch the spectacular sunset from our comfortable bean bags. Or, you can do so in private pavilion as you toast another day in Bangkok. View Rooftop Bar Bangkok has a 180-degree panoramic view straight down the famous Ratchaprasong district. So, it offers a view of Bangkok that cannot be seen anywhere else in the city. The bar provides an uncontested backdrop of the Bangkok Skyline. This allows you to hear the hustle and the bustle of Bangkok’s Fashion District. While doing that, you can watch the city move beneath you. This Bangkok bar is thus not only popular during Bangkok’s New Year’s celebrations. Guests from all walks of life also enjoy it on a daily basis. Couples appreciate the romantic moments they have amongst the stunning views while sipping on a glass of wine. Meanwhile, groups of friends or colleagues can unwind and enjoy each other’s company. They can share tasty comfort food or View Rooftop Bar Bangkok’s signature cocktails. The bar also serves signature dishes such as View Bangkok burger, Trio Burger, River Prawns Tom Yum Pizza. With unparalleled views of the Bangkok Skyline and delicious food and drinks, you would not want to visit other rooftop bars. And who says that enjoying rooftop bars always needs to be an evening thing to do? You can greet the morning with a smile and a freshly-brewed cup of cappuccino from 8:00 am onwards. On the other hand, you can unwind after a swim at the outdoor infinity pool also located on the 9th floor. While doing that, you can observe how people in Bangkok get ready for the new day. Or, you can sit back and unwind after a productive afternoon spent exploring Bangkok’s many attractions. While waiting for the sun to set, you should not miss a refreshing drink and some snacks in your hands. Just sip, savour, and watch the sunset over Bangkok. With this kind of view, any moment can become a special one at this best rooftop bar in Bangkok! It is very simple to get to View Rooftop Bar Bangkok. This is because of the hotel’s convenient location right at the Pratunam intersection. 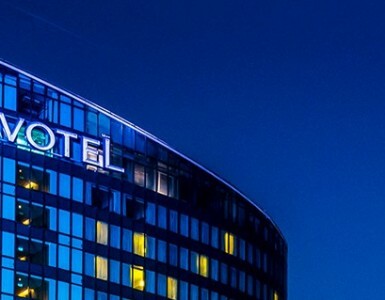 The rooftop bar is located on the 9th floor of Novotel Bangkok Platinum Pratunam. It is right above The Platinum Fashion Mall. It is a breeze to reach View Rooftop Bar Bangkok either via personal car or BTS Skytrain. Other public transportation such as the commuter boats of the Sansaep canal is possible and also very convenient. The commuter boat’s Pratunam Pier is right opposite the hotel building. This makes it a place for your after-work drinks, or a weekend treat to celebrate. View Rooftop Bar Bangkok nestles right on the 9th floor of the hotel. It overlooks a panoramic view of the Ratchaprasong district. Its decoration is welcoming and relaxing. Comfortable seating such as bean bags is available for visitors to relax and unwind. Kick back and unwind with great deals suited for groups big and small like the daily Happy Hour with its ‘Buy 1, Get 1 Free’ offer from 5 pm – 7 pm. Different promotions for each day are also offered as Seven Days Seven Promotions. Keep your appetites sated with tasty snacks and comfort food like burgers, French fries and pizzas. But this doesn’t mean that View Rooftop Bar Bangkok isn’t a great place to take that special someone! It’s easy to enjoy the romance of intimate and cosy moments at the private pavilion. You can relish the view of the Bangkok Skyline, be it during sunset or in the evening hours. For more information, please click View Rooftop Bar Bangkok.